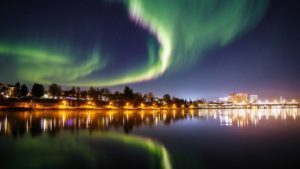 The 5th Swedish Cancer Research Meeting will take place at Folkets Hus, Umeå, October 3-4, 2019. The meeting will cover a wide area of cancer research including; Artificial intelligence, Epidemiology, Experimental studies, Genetics, Imaging, Immunotherapy, Liquid biopsies/Biomarkers, Mouse models and Tumour biology. The meeting starts with Registration & Coffee Thursday October 3 at 9 a.m., and ends Friday October 4 at 3 p.m. A preliminary program will soon be available. The three strategic cancer research networks U-CAN, StratCan and BioCARE (https://www.med.lu.se/biocare) are delighted to announce the upcoming 5th Swedish Cancer Meeting which continues the tradition established by the four previous meetings held in Malmö (2012), Uppsala (2013), Stockholm (2014) and Gothenburg (2016). For this year´s meeting Cancerakademin and the Regional Cancer Centre North (https://www.cancercentrum.se/norr/) has been added as organizers, illustrating the interest of the networks to interact with regional and national education and larger cancer health care system. Maximum poster size is 140 cm (height) × 100 cm (width). Recommended poster format is portrait (standing) 120 cm × 90 cm. A poster awards will be distributed during the Plenary 3 session at 13.00-14.15 on October 4th. Deadline for abstract submission for posters or short talks is May 5. The limit for the length of Abstracts is 300 Words. Registration is open between February 7 and August 31. We recommend that you carefully read the information in the section registration terms and fees before filling in the registration form. Payment must be made in advance of the conference. The registration fee is 1000 SEK for all participants that register before August 31. A conference dinner on Thursday October 3 is included in the registration fee.In addition, the SFO provides a waiver for the registration fee to a certain number of participants for their respective SFO. Please contact your local SFO contact person to sign up for free registration fee. A cancellation fee of 2000 SEK will be charged by those who cancel their registration after August 31, nor for no-shows for any reason. Hotel rooms at the hotels below are pre-booked with discounted rate, presumed that the hotel reservation are made by telephone or e-mail. Hotel rooms at reduced price is guaranteed until August 6. After that date we cannot offer hotel rooms at reduced price. *All rates include breakfast and VAT. Accommodation is not included in the registration fee. The hotel rooms must be booked and paid by each participant. You will be able to pay by credit card or by cash. All hotels can invoice Swedish organizations, but not abroad. Please contact the Sara Huggert – sara.huggert@onkologi.umu.se if you have any further questions. Preliminary program will soon be available!